User interface from DekTec StreamXpert. Dektec’s StreamXpert real-time transport-stream analyser gains an new feature with the latest release, version 2.3. The MPEG-2 analyzer now includes OTT analysis. OTT streaming is rapidly establishing itself as a mainstream way to reach large audiences, with higher requirements for content availability and quality as a result. It is in the interest of broadcasters and operators to assure that manifest files on its servers can be reached, are complete and correct, and that the referred streams decode with no problems. 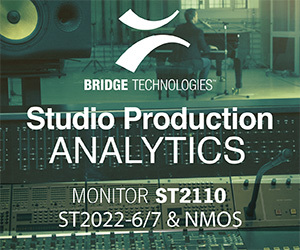 DekTec's industry-standard MPEG-2 transport-stream analyzer, StreamXpert, provides detailed statistics on PIDs, services and tables in real time. It analyzes and decodes audio, video and system information. This new OTT analysis functionality is included in the standard StreamXpertv2.3 package and freely available to those who have purchased their StreamXpert license or latest maintenance extension less than 12 months ago.